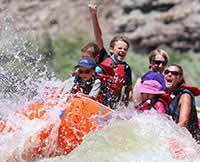 Our family made our first rafting trip last year, a family trip on the Green River. We're hooked ... I expect we'll be back as soon as we can manage! My 11-year old daughter and I are both "water-rats," but my husband doesn't like to get splashed and really didn't want to come. Our goal for the week was to convince B. that "in-the-water" was just as great as "near-the-water" ... and we succeeded! He was negotiating with the rest of us for kayak time by the end of the trip. He was also dubious about "camping" for 4 nights, but the accomodations provided by Western were an eye-opener for us (talk about luxury camping...). I enjoyed the breathtaking scenery and the pristine surroundings. I think Desolation Canyon is misnamed - it's beautiful - but perhaps that name is good to keep too many people from "discovering" it. From the wonderful, eye-popping flight over the canyons, the wildlife sightings, the light on the canyon walls (especially early morning and late in the day), to the lovely campsites - it was hard to absorb so much natural beauty. The surroundings helped me to unsnarl my thoughts, relax into serenity, and remember what's important in life. Despite all the superlatives above, our guides were the heart of our trip. Wendy is the best role-model of a smart savvy confident competent caring fun "strong woman" I could ever hope for for my 11-year-old daughter(and for me!). Wendy and Russ surprised us at every meal with delicious fresh food (I thought I'd lose weight on the trip, what with all the outside activity, but no such luck). They defused small interpersonal conflicts with tact and discretion, they came to check on us in the middle of the night when it threatened to rain, and they tolerated our wacky senses of humor(?). They educated us on the natural and human history of the canyon, and they demonstrated (by example) how to care for and preserve the delicate desert wilderness. They have beautiful singing voices, and wicked senses of humor...and they were both just plain nice. They both worked *very* hard, but always gave the impression of casually hosting us in a beautiful big garden. Thanks for a *wonderful* adventure.